Stratus is dedicated to providing innovative cleaning solutions for hard floors, including difficult tile and grout surfaces and high gloss, slip resistant strip and wax services for Vinyl, Concrete, Tile and Marble floors. Your facility’s flooring surfaces are subject to tough wear and can be easily damaged. Most are protected with several thin coats of polymer or wax finish, providing a glossy, reflective coating that can be enhanced or restored with mechanical buffing. This film can wear out with time. To maintain the coating and the floor surface underneath, you need Stratus Building Solutions hard floor care services. Whether you use our services just once a quarter, or you would like add these services onto your regular contract - we are able to provide what you need, when you need it! Using fast-acting, deep penetrating chemicals that loosen and remove old finish and prepare the floor for recoating. Stratus will provide the greenest services available to assure a deep clean. After stripping, Stratus will provide an expert polymer-based finish forms a shield against traffic and soils which will makes maintenance easier, to provide you shine and beauty that becomes part of your internal décor. Regular cleaning enhances the appearance and increases the life of the finish. If you are contracted with us for regular cleaning services, you can expect the strip and wax to last. A clean floor is always easier to clean than a dirty one! Different areas of a facility have different levels of traffic and wear. By combining burnishing or spray buffing with thorough cleaning, you can enhance the appearance and increase the life of the finish. Using state of the art technology, our unique cleaning methods tackle even the most difficult problem floors. 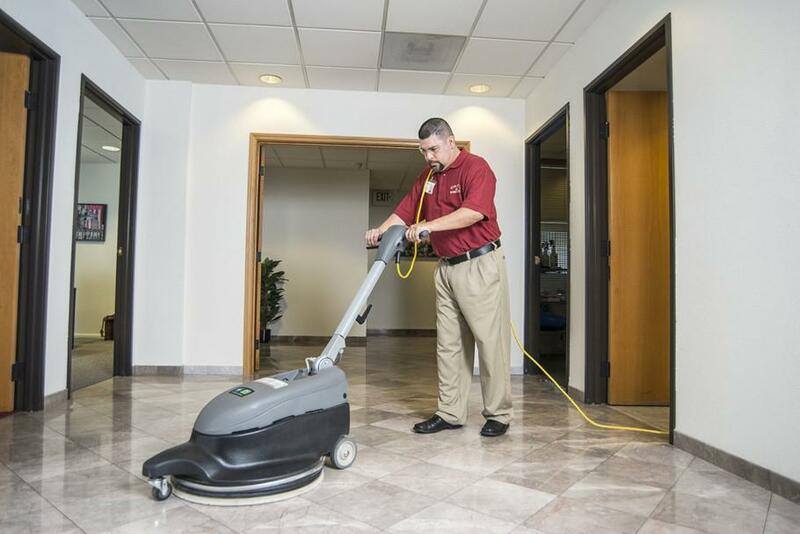 Our highly trained experts utilize the latest equipment and products available and can solve any commercial cleaning job, leaving your floor spotless , slip resistant and hygienically clean. We minimize the use of high pressure cleaning as this as this can damage surfaces, strip paint or coatings and loosen grout. Instead, we utilize the industry's best equipment with unique, wash, scrub and dry technology that uses 90% less water and detergents than traditional cleaning methods. Our Building Solutions work greener by using less energy, less water and fewer harsh chemicals that can damage the environment. Quality floor services add greatly to the overall aesthetics of your facility, often the first thing a potential customer will notice. Properly maintained floors keep your facility safe by preventing slip and fall accidents. A proper floor maintenance program also extends the life of your floor products, making for a wise investment. Contact a Stratus representative today to find out how easy and affordable truly clean floors can be.